To dribble means ‘to flow in drops‘ and, if you’re talking about a person or animal, it means they have saliva trickling from their mouth. 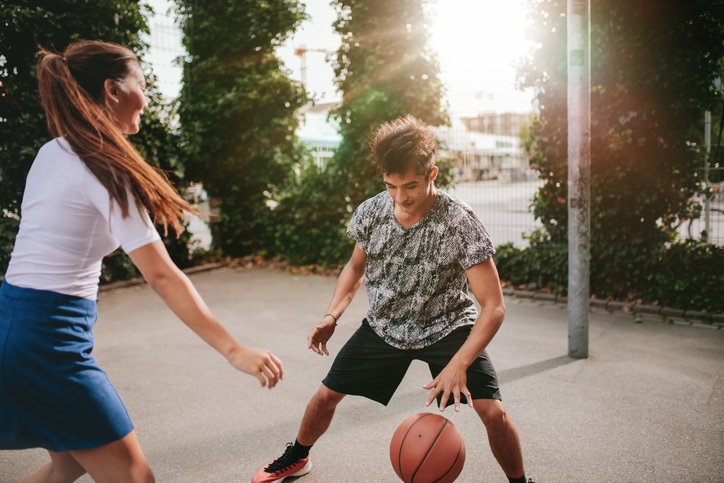 In sports, to dribble is ‘to move a ball or hockey puck along by bouncing or by giving it a series of short kicks or pushes.’ As a noun, a dribble is a small stream or drop falling and, more broadly, a small quantity of anything. It can also be saliva coming out of the mouth and, in sports, the act of dribbling. A small amount of coffee spilled over the edge of the cup and dribbled down the side. James was dribbling in his sleep. The soccer player dribbled the ball past several of her opponents. Dan turned on the faucet, but only a dribble of water came out. "Would you like more wine?" "Just a dribbled." Joanne thought the dog's dribble was gross. The player's dribble got him past the other team's defense. Dribble dates back to the mid-16th century. It is a frequentative of a verb we no longer use, drib (although we do have the expression in dribs and drabs). In other words, dribble is to drib many times, or constantly. Drib itself is from the early 16th century, and is probably a variation of the verb drip. It has been used figuratively in soccer since the mid-19th century, and this use extended to other sports by the late 19th century. The noun comes from the verb, and dates back to the mid-17th century.